The forms of nature has always inspired poets, musicians – and architects. The exhibition “Form Follows Nature” at aut (architektur und tirol) – wants to show “How can that be a reflective approach to nature inspiration for shapes, techniques and structures”. 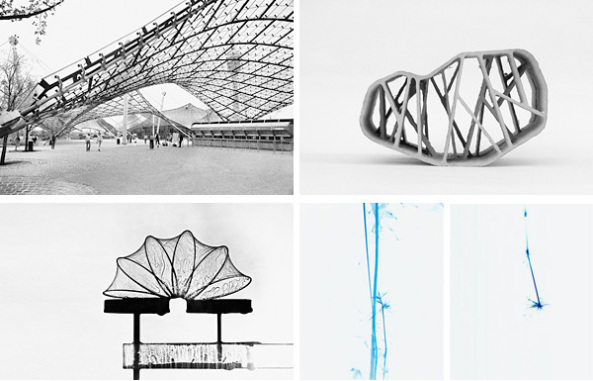 By showing works of Frei Otto, Carsten Nicolai and Finsterwalder architects. Frei Otto was interested in economic and ecological construction methods and studied forms of nature – including bone, spider webs, bird nests – an energetic and constructive aspects. Based on the new findings emerged accordingly optimized membrane structures and tire constructions.